In the Dirt: 2006 Miracle On Ice? 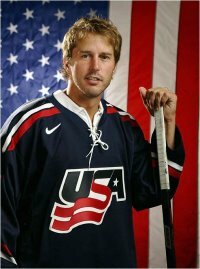 Will 2006 be the year the gold returns to the USA for men's ice hockey? Well it certainly will take a miracle. This version of America's best leaves a lot to be desired. While this team does have its collection of stars, they definitely fall short of what the other countries are offering. The lack of any high quality goal tending, old age on defense, and no depth up front will lead to the downfall of the 2006 team. First thing is first, in order to win you must have strong goal tending. In 2002 team Canada had Martin Brodeur and before that in 1998 the Czech Republic had Dominik hasek. These two are undoubtedly two of the best in the game. Who does this years USA squad boast? Rick DiPietro starting, back upped by career backup John Grahame and the bewildered Robert Esche. It's certain this team will be yearning for the days of Mike Richter's unreal Olympic skills. Not that these goalies are bad, it's just that they don't stack up against what Russia(Khabibulin, Nabakov), the Czech Republic(Hasek, Vokoun), Canada(Brodeur, Luongo, Turco), Sweden(Lundqvist), and even Germany(Kolzig) are offering. They aren't even carrying the best American goal tender, Ryan Miller of Buffalo. DiPietro seems to be the likely starter. He has been hot and cold this year playing for the Islanders. Posting 19 wins along with a mediocre .892 save percentage and a lame 3.38 GAA. The Islander goalie is only 24 and will probably grow into expectations that come from being the first overall pick in the 2000 draft, but he has yet to play at any type of gold medal level. Robert Esche is coming off an injury not long ago. Since his injury he has appeared in 7 games posting a 4-2-1 record. But Esche who has a 3.15 GAA and a .892 save percentage has allowed 3 or more goals in 4 of those 7 games and has had little to do with the Flyers wins in most cases. As shown in a 5-4 victory the other night the Flyers get by mostly on their ability to run up the score sheet. John Grahame has definitely faired better than the other two American goalies with 22 wins, a 2.68 GAA and a .900 save percentage. To go along with all of that he has been the host of 5 shutouts, second best in the NHL. But Grahame who has been a journeyman his entire career might not have the experience to backstop the US to a gold medal. In 2002-03 the year the Lightning won the cup they didn't trust in Grahame and instead went out and acquired Khabibulin who lead them to their eventual Stanley Cup. Does John Grahame the goalie who has given up 3 or more goals in 20 of his 40 games this season have it in him for a gold medal run? USA hope so. Aside from USA shortcomings in goal they are probably too experienced defensively, read: old. Their captain, Chris Chelios is 44 years old. While he is having a decent season, he has not been a factor offensively and might be in danger of injury or just tiring. Darian Hatcher is not quite as old, 33, but the slow defensemen should be rendered useless in the wide open ice of the international competition. Defensemen Mathieu Schneider and Brian Rafalski are also getting up there in age. Where they have a glaring hole is upfront. After Mike Madano and the oft injured Keith Tkachuk they lack the depth of scorers the other teams possess. Bill Guerin has been having a horrible season. Has admitted that he has no confidence and should retire after the season is over. There is no assurance Mike Knuble can score without his play maker Petr Forsburg there to feed him beautiful passes. I also fail to see Islander wingers Jason Blake and Mark Parrish doing anything more during the Olympics to help their team then they have done to help the Long Islanders fall into the bottom of the NHL. Don't get me wrong, I don't think the USA is too far off. They will be there to compete in 2010 when they get things right and name Ryan Miller, 20 wins, .924 save percentage, and 2.23 GAA the starting goalie. They will also be better off when players like Chris Drury, Brian Gionta, and John-Michael Liles have larger roles. Also where is Mike York? Until some of America's younger players mature it is safe to say that Sweden, Russia, Czech Republic, and Canada all have better chances. All have great goal tenders, speedy sharpshooters, and faster bigger defensemen. That Chris Celios is a hottie.